Stunning Keisha: I Am Wonderful! Thank You! Thank You! 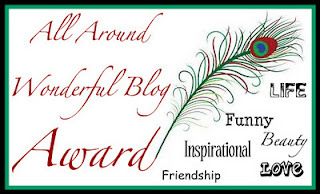 A week ago, I received the all Around Wonderful Blog Award from Star and Leo over at Andrea and the Celestial Kittens. They only have about 50 followers so you should go over there and support them. If you think Spitty is handsome—which he is, of course—you'll LOVE Leo! I covet this award because it has a picture of a peacock feather on it and I love playing with peacock feathers. Just as the award states, I try to be funny, inspirational, loving (to my furrends, not TW), and a loyal furrends to my followers. I don't have to tell you about the beauty part since I AM the World's Most Stunning Cat so all the photos—even the out of focus ones—radiate my beauty. C'mon Woman! I got my feather and I want to play! Hmmmm, last time I gave an award out, only 1 of 5 blogs accepted the award—Thank you Shelly!— so I'm gonna say, ♪ if you want it, here it is, come the get it. You better hurry cos it's going fast. You better hurry cos it may not last. Cha cha cha ♪♩As you can hear, I also have a fab singing voice, which I treat my peeps to every night after 1 a.m. 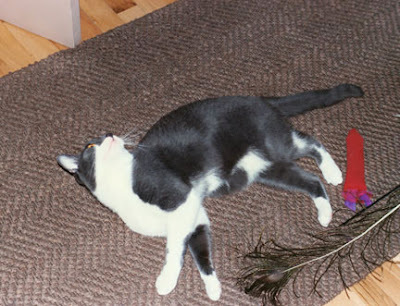 I drag my feathers over to TW's bedroom and serenade her; but, sadly, she doesn't depreciate it. Seriously, what's wrong with her? Below is the music so you can sing along too. Conga rats on that award CK, and you are well deserving for sure. Hope you can play with that wonderful fevver. We see you have one of your very own. Have your self a terrific Tues.
Congrats CK and you totally deserve it as always!!! Congratulations on the award! I tink it is very deserfing and you are stunning. Oh, we are CONSUMED with envy...you have a real peacock fedder! Oh, and you got a groovy award, too...CK, you have all the luck. Mommy can't even FIND me a peacock fevver! No, Spitty doesn't know that about me but he's going to find out when he comes to visit. Sigh. Congrats on your award, CK!!! We especially love the line about you being the World's Most Stunning Cat so all the photos - even the out of focus ones - radiate your beauty. hehe! Did you put that in there just for us? So what's with that Katie & Glogirly business on our signature??? Google, what the fluff? Ok fine Mr. Google. So you don't like ampersands. Well take THAT! Congrats on that most Wonderful award! You deserve it so CK, you are all those things! This is an especially fetching phtot of you CK. I might print it out and use it as a pin-up in my tent. Katie congrats on the award that is a interesting prespective you have on the floor. I was finally able to get Mom to blog so now you could increase the number of respondants.